In the very heart of the charming Tuscan countryside, among the smooth hills of Sienese Chianti and the fragrance of its green vineyards, you will find the Podere Lucignano Secondo Agriturismo, a mansion built in 1898, now elegantly restored by Sartini Rossi Family and turned into an exclusive relais. The Villa is divided in 1 apartment at first floor + 1 apartment at ground floor: 5 twin / double bedroom, 10 sleep, 4 bathroom, garden, panoramic terrace, private parking. On request the two apartments may be connected, to form a single living area. 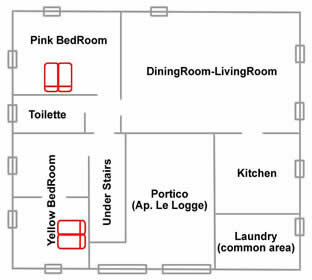 The Apartment Le Logge. First floor: 3 en-suite twin/double bedrooms each with private toilet/bathroom, 1 living/dining room with kitchen-area and fireplace, 1 sitting room with fireplace. Ground floor: 1 sitting room opening onto the garden, 1 panoramic terrace, park, private parking place. The Apartment Le Logge is made up of three en-suite twin/double bedrooms overlooking the garden, each with private toilet/bathroom; there is a fireplace in both the wide living room with kitchen-area and the elegant sitting room; from the lovely ground-floor sitting room, thanks to its gorgeous glass gallery, you can enjoy a panoramic view of the garden. The rustic Apartment La Mangiatoia. Ground floor: 2 twin/double bedrooms with 1 private toilet/bathroom, 1 kitchen, 1 living/dining room with fireplace, 1 panoramic terrace, park, private parking place. The rustic Apartment La Mangiatoia is made up of two twin/double bedrooms, overlooking the garden and one private toilet/bathroom; the spacious kitchen is next to the living/dining room, wide and elegant, provided with a big fireplace, one window and two bright glass doors. The whole area surrounding the Villa, in the heart of Sienese Chianti, is studded with mediaeval villages, churches and castles, easy to get to (some of them even on foot). Distance from: Castelnuovo Berardenga 10 Km; Gaiole in Chianti 15 Km; Radda in Chianti 20 Km; Monteriggioni 25 Km; San Gimignano 50 Km; Montalcino 50 Km; Pienza 65 Km; Montepulciano 60 Km. 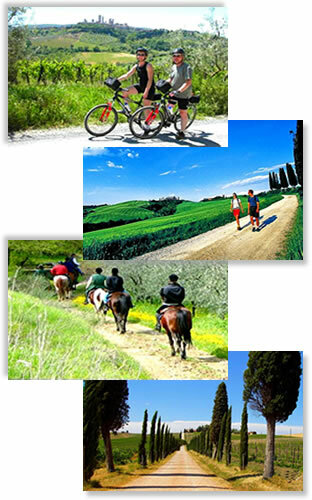 The location of the Villa is the ideal starting point for cultural tours (even one-day long) of the main Tuscan towns. 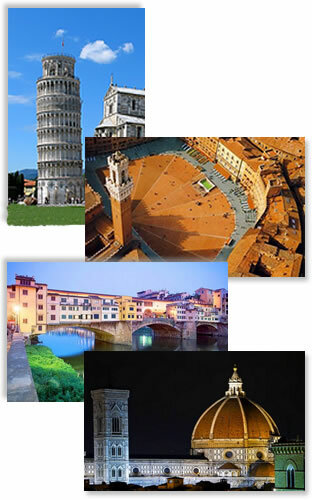 Distance from: Siena 15 Km; Arezzo 60 Km; Florence 65 Km; Pisa 130 Km. The Mediterranean Sea and two lovely seaside resorts, Castiglione della Pescaia and Punta Ala, are about 80 Km from the Villa. For the lovers of trekking and cycling there is a wide range of charming paths and white roads crossing breath-taking landscapes: your excursions will plunge you into an uncorrupted natural scenery, far from mass tourism. Every year, in October, the Comune di Gaiole in Chianti (15 Km from the Villa) organises the famous bicycle race in 1930s costume called EROICA, a must for every real lovers of the history of cycling. The Provincia of Siena and all Tuscany boast a lot of museums known all around the world, where you can find all through the year Renaissance, Mediaeval, Ancient, Etruscan works of art. Moreover, very often, modern and contemporary art exhibitions are organised in the main towns, all easy to get to by car. 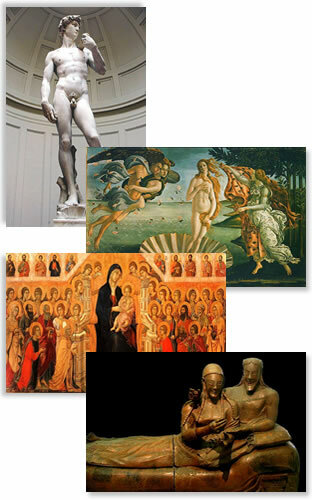 Most famous museums in Florence: Galleria degli Uffizi, Palazzo Pitti, Giardino di Boboli, Cappella Brancacci. Most famous museums in Siena: Opera del Duomo, Santa Maria della Scala, Pinacoteca Nazionale, Museo Civico, Palazzo delle Papesse. There are many music and theatre events, especially during the summer. 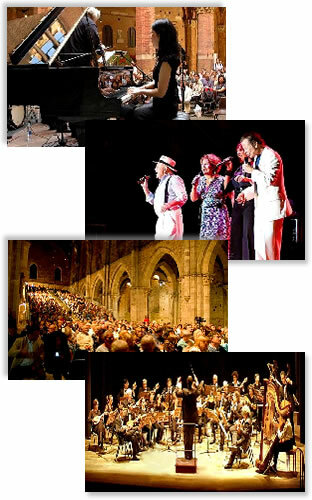 The world-famous Chigiana Music Academy in Siena (15 Km from the Villa) organises teachers and students concerts from June to September. In July and August, at the Cistercian Abbey of San Galgano (about 30 Km from the Villa), in an impressive mediaeval setting, you can enjoy open-air operas. All through the year, the famous Teatro Povero plays are put on in the streets of Monticchiello, near Pienza (40 Km from the Villa). In the Provincia of Siena, which boasts a millenary history, a lot of mediaeval traditions are still alive. The PALIO DI SIENA, the historical horse-ride of the Sienese Contrade, takes place twice a year (July 2nd and August 16th) in the impressive Piazza del Campo (15 Km from the Villa); just before the ride starts, you can see the mediaeval costumes of the Contrade during the spectacular Passeggiata Storica. The Prove (rehearsals) for the final ride start four days before the Palio itself; after the ride, everybody can take part in the celebrations of the winning Contrada, with Chianti wine toasts. In last Sunday of August, in the village of Montepulciano (60 Km from the Villa), there is the famous BRAVIO DELLE BOTTI, a race in costume where the competitors push barrels along the main street. The FESTA MEDIEVALE in MONTERIGGIONI (25 Km from the Villa), in July, is a revival of mediaeval daily life: you can taste food and venison cooked according to the Tuscan tradition. The Villa is set in the very heart of Sienese Chianti, one of the most famous precious-wine-producing areas in the world. 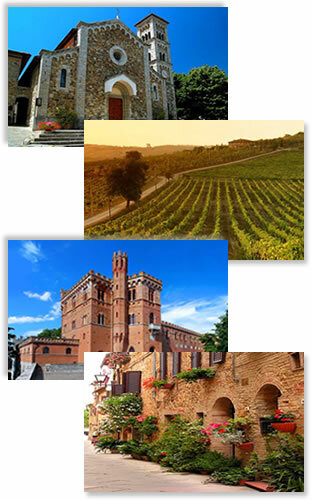 Here you will enjoy the aroma of genuine Chianti wine, and travel along beautiful roads in the very heart of Chianti countryside, studded with mediaeval churches, castles and villages. A few kilometres from the Villa is Montalcino, home of the famous Brunello. 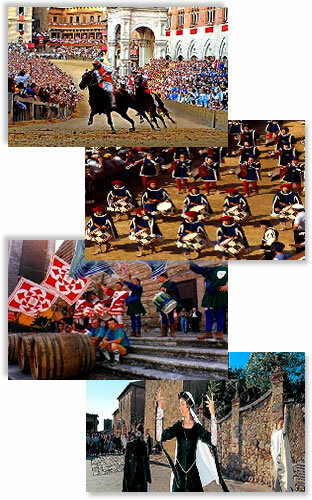 Moreover, in the streets and squares of the mediaeval villages scattered around the Provincia di Siena, many village festivals are organised in spring and summer. MERCATO SETTIMANALE DELLE MERCI (Weekly Open-Air Market): all Wednesdays, over 500 sellers from everywhere in the Tuscany gather in Siena, about 15 Km from the Villa: many of them sell women s shoes and Made in Italy women s wear. MERCATINO DELL ANTIQUARIATO (Antique Little Market): the third Sunday of every month, a market made up of about 80 stalls is organised in Piazza del Mercato, in Siena (about 15 Km from the Villa). FESTA DI SAN GIUSEPPE (St Joseph s Day): on the occasion of St Joseph s Day celebrations, from March 19th to the beginning of April, along Via Giovanni Dupre in Siena (about 15 Km from the Villa) you will find picturesque stands selling delicious sweet rice fritters and traditional hand-made wooden toys. FESTA DI SANTA LUCIA (St Lucy s Day): on December 13th, St Lucy s Day, along Pian dei Mantellini street in Siena (about 15 Km from the Villa) you will find picturesque stalls selling pottery, hand-painted earthenware and baked-clay bells. FIERA DEL MESTOLO (Ladle Fair): this amusing, uncommon fair takes place in Arezzo (about 60 Km from the Villa) around September 10th. It is made up of over 300 stalls selling kitchenware, especially ladles, humble and precious kitchen implements here available in all shapes and sizes. FIERA DELLA MADONNA DEL CONFORTO: this fair takes place in Arezzo (about 60 Km from the Villa) in mid-February, during the religious celebration of the Virgin Mary. On the stalls you can buy sweets and toys. FOTO ANTIQUARIA: this exhibition, dedicated to photography amateurs, takes place in Piazza Grande in Arezzo (about 60 Km from the Villa) the last week of April and September. There are more or less 100 stalls, showing everything about the history of photography: old cameras, lenses, tripods, second-hand objects. MERCATINO DEI RAGAZZI (Children s Market): this particular charity fair takes place in Piazza Garibaldi in Arezzo (about 60 Km from the Villa), towards the end of March. It is organized by children, who sell goods they have been gathering in the last few months. 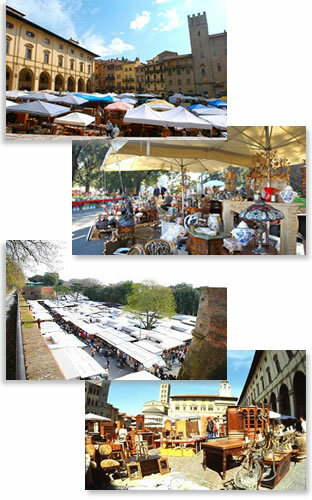 MERCATO DELL ANTIQUARIATO (Antique Market): this fair takes place in Piazza San Francesco and Piazza Grande in Arezzo (about 60 Km from the Villa) on the first weekend (Saturday and Sunday) of every month. 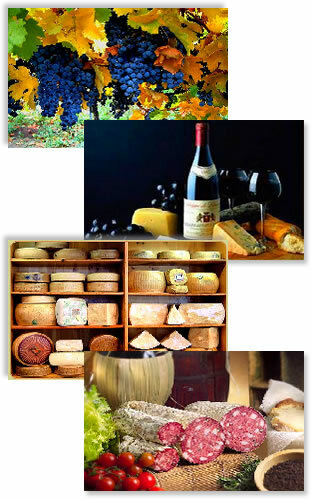 It brings together over 100 sellers from all Italy and many other European countries. MERCATINO DI NATALE (Christmas Market): all over the Christmas period, in Piazza San Jacopo and Piazza Risorgimento in Arezzo (about 60 Km from the Villa), you will find a lot of stalls selling Christmas decorations, gifts and trinkets. At about 1 hour drive from the Villa there are many Outlet of prestigious Italian Brands, where you can buy with discounts up to 40% compared to normal shops. OUTLET VAL DI CHIANA FOIANO (AR): Cavalli, Ferre, Laura Biagiotti, Versace. OUTLET MONTEVARCHI (AR) Loc. Levanella: Prada. OUTLET VALDARNO (FI) Loc. Leccio-Reggello: Gucci, Giorgio Armani, Ungaro, Valentino, Ferragamo. 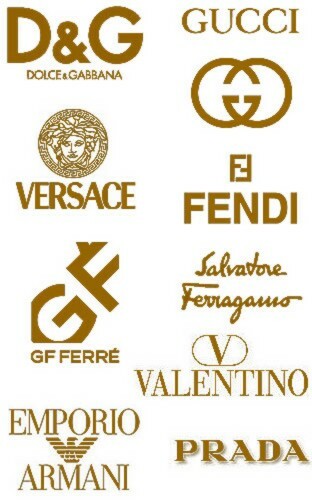 OUTLET RIGNANO SULL'ARNO (FI): Fendi, Dolce & Gabbana. 007 QUANTUM OF SOLACE (2008, directed by Marc Forster): the first scenes are shooting in Siena and Talamone towns, on the spectacular caves of Carrara and on the shores of Lake Garda. The GLADIATOR (2000, directed by Ridley Scott): Russell Crowe come back at home of his loved ones; the scene was shooting in a Villa in Val d'Orcia, near the village San Quirico d'Orcia. LIFE IS BEAUTIFUL (1997, directed and starring by Roberto Benigni): The movie begin in the main square of Arezzo town. THE ENGLISH PATIENT (1996, directed by Anthony Minghella): the main scenes of the movie are shooting in the Monastery of Sant'Anna in Camprena, near the village San Quirico d'Orcia. STEALING BEAUTY (1996, directed by Bernardo Bertolucci): The movie is shooting in a Villa near the village Gaiole in Chianti, on the hills around Siena. 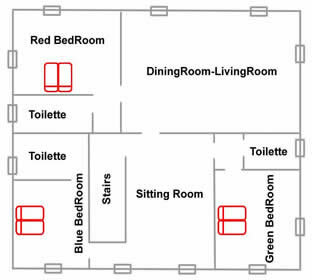 Internet Broad-Band Wi-Fi Connection, TV, satellite TV, HI-FI stereo/radio, CD/DVD/DIVX player, Microwave, Nespresso Machine, barbecue, dishwasher, washing machine, iron, hair-drier, garden furniture, private parking. Both kitchens are really very well equipped. The Villa is ready to rent EVERY DAY OF THE YEAR. CHECK-IN: from 4:00 p.m. to 7:30 p.m. If you happen to be late, please call the following mobile phone number: (+39) 328 133 70 55. CHECK-OUT: before 9:30 a.m. of the day following the last night of your stay. CREDIT CARDS: Visa, Mastercard, Maestro credit cards are accepted. 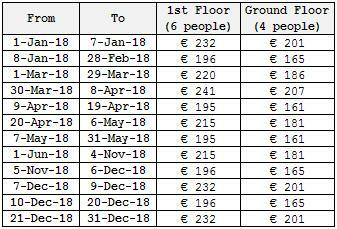 EXTRA: We can add 1 extra bed for EUR 30 per night (on request only); We can provide 2 baby cot for free (on request only). NUMBER OF PEOPLE: only the people who have checked in are allowed to stay at the Villa. Any guests must produce their identity papers at Check-In. If you are coming FROM NORTH: take motorway A1 and leave it at the Firenze Impruneta Exit; then take Siena-Firenze Junction. If you are coming FROM SOUTH: take motorway A1 and leave it at the Val di Chiana Bettolle Exit; then take Siena-Bettolle Junction. When you get to Siena, take road S408, towards Montevarchi; once you get to Pianella, go on for 0,6 Miles and then turn right to S.Regolo on road C24; the road C24 is the second right turn after you pass through Pianella. 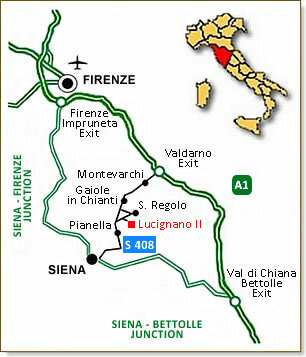 Go on for about 1,2 Miles, and you will get to Lucignano II. To easy get the Villa we strongly recommend only the route above. Don't go to A1 Valdarno Exit or Greve in Chianti. A car is strongly recommended to get the Villa. Enzo & Liliana will be happy to answer all your questions! QR-Code: SCAN TO JOIN US!